Why do I need to install Razer Synapse for the Razer Seirēn and Razer Seirēn Pro to work? As different operating systems may or may not have sufficient features to utilize the capabilities of the Razer Seirēn Pro microphones, driver installation via Razer Synapse is required to enable the microphones to record at high definition 24 bit, 192 kHz and unleash their full potential. Since updating to Windows 10, Razer Synapse does not detect my device and show the correct product configurator. What should I do? If you encounter this, please perform Synapse update through "Settings" > "CHECK FOR UPDATES." If the update is not able to run or Synapse not able to load, please uninstall Synapse and download the latest Synapse Framework from Razer Support site. What is the main difference between the Razer Seirēn and the Razer Seirēn Pro? The Razer Seirēn Pro includes a high-pass filter to remove low-end ambient noises such as hums, rumbles, traffic and wind which streamers may face when creating content. 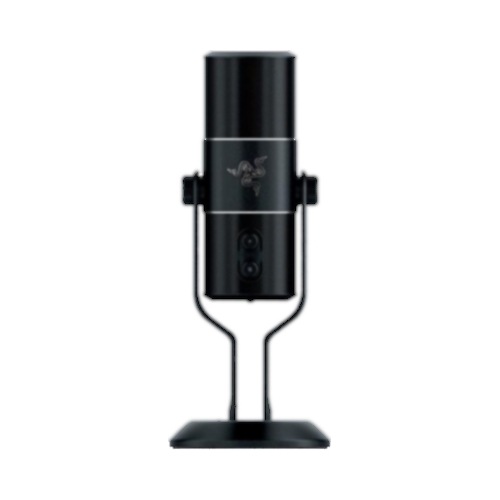 Additionally, the Razer Seirēn Pro gives streamers the option of recording via an analog XLR or digital USB connection. The XLR cable allows the Razer Seirēn Pro to be plugged directly into mixing boards and cameras. How do I use the XLR output? Plug in the provided 5-pin to 3-pin XLR splitter cable, ensuring that both 3-pin connectors are plugged into your recording device and please ensure "phantom power" is switched on to power the Razer Seirēn Pro. To extend the connection length, please connect two(2) 3-pin XLR extension cables (purchased separately) between the recording device and the provided splitter cable. Can I use both USB and XLR at the same time? The Razer Seirēn Pro should only be used with one connection method (USB or XLR) at a time. All microphone functions operate in digital mode, while in analog mode, the direct headphone output function do not operate as these are not useful in an analog recording situation. I am unable to access my connection ports when the Razer Seirēn Pro is directly mounted on to a Microphone Boom Arm. Please ensure that the steel washer is removed before mounting the microphone as the screw threads on the Razer Seirēn Pro are deep enough to secure the microphone to the boom arm. You will now be able to access the connection ports once the steel washer that's hindering access is removed. For the best experience when using a microphone boom arm, please consider purchasing the Razer Seirēn Pro shock mount at Razer Store. I am having problems installing / locating the necessary drivers for the Razer Seirēn Pro on Windows. The Razer Seirēn Pro requires dedicated drivers to achieve high bit rate recording. Please install Razer Synapse to obtain to the latest drivers for your Razer Seirēn Pro. I'm using the Razer Seirēn Pro on a Mac, do I need to install Razer Synapse to use it? No. Using the Razer Seirēn Pro on the Mac OS does not require Razer Synapse drivers. Mac OS natively supports high bit rate recording. However, installing Razer Synapse will provide you with advanced settings for your Razer Seirēn Pro. Which direction should the microphone be facing when I begin recording for a stream? When recording for a stream or when recording audio for videos with the Razer Seirēn Pro, you should have the Razer logo facing away from you and the OLED screen levelled and facing you. Do not record with the top of the microphone facing you as the condenser microphones inside the Razer Seirēn Pro are not positioned at the tip. How far away should the Razer Seirēn Pro be from me when I am recording? The optimal recording distance is 8 inches/20 centimeters. Will I be able to use the Razer Seirēn Pro with my own microphone stand / arm? Yes, the mounting port is an industry standard 5/8 inch port. Is the Razer Seirēn compatible with other professional recording software? Yes. The Razer Seirēn Pro is compatible with professional recording software such as ProTools, Logic Pro X, Garage band, Sound Forge and Cakewalk. What do all the knobs and buttons on the body of the microphone do? Does the Razer Seirēn Pro come with any recording accessories? Yes, you can purchase the shock mount and pop filter exclusively at Razer Store. We are sorry if there are any delays in processing your order. The product may be out of stock or the order may be under protection/fraud review. Please don't hesitate to check your order status at the Razer Store page by entering your information at the Order Status page. I think my Razer product is defective and would like an RMA / exchange. What can be done?